On 10 November, hosted by Sakya Dechen Ling, Lama Jampa taught the second part of Atisha's 'Jewel Rosary of a Bodhisattva', which he began teaching earlier this year. Atisha's teaching is a succinct and pithy guide to practising the Mahayana path in every aspect of life and Lama Jampa praised the text as a valuable set of instructions for approaching daily life and spiritual practice. In the afternoon, Lama Jampa bestowed the initiation of Saraswati. This initiation is from the Bodong lineage. One of the main female embodiments of wisdom, Saraswati is also associated with artistic accomplishments, in particular those of poetry. Lama Jampa's next teaching will be in Manchester on the weekend of 29 to 30 November. Lama Jampa will teach the final part of 'The Lamp that Dispels Darkness’, Karma Thinley Rincpohe's detailed commentary on the Third Karmapa’s ‘Discriminating between Consciousness and Primordial Wisdom’. Please click here for further details. 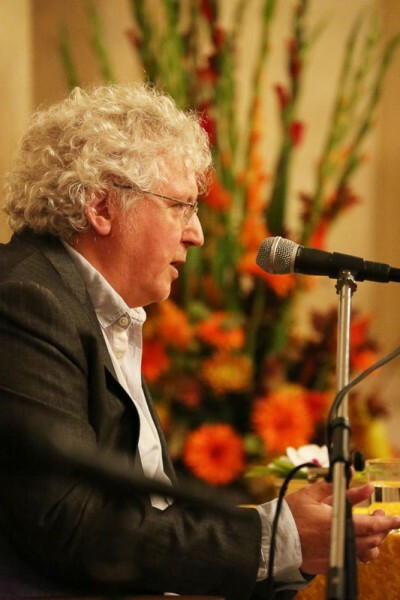 Lama Jampa has just returned from his autumn teaching tour of California. This was a busy visit which saw him teach in both Los Angeles and San Francisco. Lama Jampa and family arrived in Los Angeles on Friday October 25 and were greeted by members of the Sakya Samten Ling sangha. The teachings on the Saturday were hosted by Sakya Samten Ling; Lama Jampa taught the celebrated text, the Eight Verses of Mind Training and bestowed the initiation of Chenrezik Mahamudra, as well as bestowing refuge upon new sangha members. The following day Lama Jampa gave an extensive discourse on the Heart Sutra, the Perfection of Wisdom, at Yeshe Nyingpo Los Angeles. At the request of Bodhi Path, Lama Jampa and family travelled to Santa Barbara on Tuesday evening where he gave a public teaching on The Parting From the Four Attachments. The final weekend was spent at Ewam Choden, the Sakya centre of Lama Kunga Thartse Rinpoche in Berkeley. This was the second time that Lama Jampa had been invited to teach there and this was a joyous occasion. The subject of the teaching was the Seven Points of Mind Training. Lama Jampa will return to Ewam Choden in April 2015 to continue with this text. Lama Jampa and family returned to London on Sunday November 2. Lama Jampa Thaye’s latest article for the Tricycle magazine blog is now available. Please click here to view the article, titled “Bringing it all Back Home". Invited by José Rodrigues, and at the request of Lama Jampa, Carl Rogers from our Bristol centre spent the weekend of 17th to 19th October in the beautiful old city of Lisbon, accompanied by Ed Curtis. On the Friday night Carl gave an introductory talk outlining the Buddhist path. He took as his theme the “three trainings” (morality, meditation and wisdom). The talk was well attended in a lovely new hall belonging to a local Buddhist teacher, and was the first Dharma event to be held there. On the Saturday and Sunday, Carl outlined the renowned Sakya teachings of the “Parting from the Four Attachments” to a good number of attendees at the Portuguese Buddhist Union. Carl relied on the structure of Jetsun Drakpa Gyaltsen’s commentary as well as Lama Jampa’s “Melody of the Gentle Lord”. The morning and afternoon sessions consisted of periods of listening, contemplating and meditating. People attending were very impressed by the clear and systematic presentation of the path. The entire weekend had been organised by José with the help of John Cox, another of Lama Jampa’s students who lives near Lisbon. José and John now intend to start a Dechen Community meditation group on the strength of the very positive feedback they received from those attending the weekend. Fundacion Sakya in Pedreguer in southern Spain is the main seat of HH Sakya Trizin in Europe. Established a decade ago, it has hosted both His Holiness and Ratna Vajra Rinpoche a number of times. Between October 10th and 12th it played host to Lama Jampa and Dechen Dolma. At the request of the centre's resident teacher, Lama Rinchen Gyaltsen, Lama Jampa bestowed three days of teaching on Thokme Zangpo's commentary on The Seven Points Of Mind Training on an enthusiastic gathering of the resident sangha and sudents from various parts of Spain. The centre itself is constructed in an exclusive resdential complex on the side of a hill with views overlooking the Mediterranean. Its beautiful and spacious temple is the centre piece of a very impressive architectural undertaking. This was the second occasion on which Lama Jampa had taught Thokme Zangpo's text this year, the first being in Mexico City. He will teach it again in San Francisco at the beginning of November during his brief West Coast teaching tour. In the afternoon, Lama Jampa bestowed the initiation of White Manjushri, the embodiment of the natural wisdom of awakened mind. This practice is regularly bestowed by lamas of all traditions upon their students to aid their development of their innate qualities of liberated intelligence. This particular initiation is from the lineage of former buffalo herder, Mati Panchen, who, due to Manjushri's blessings, swiftly realised the whole of the dharma. Lama Jampa concluded the day by reflecting on how fortunate we have been this year in receiving visits from both His Holiness Sakya Trizin who made his first visit to Sakya Changlochen Ling in France on the occasion of its 25th anniversary in July and His Eminence Ratna Vajra Rinpoche who visited our UK Centres in London and Bristol in May. Lama Jampa urged the sangha to build on these blessings and continue to develop the activities at our Centres. On Thursday 2nd October in Bath's glorious Assembly Rooms, nearly 200 people joined Sakya Buddhism Bath to hear Lama Jampa's clear and definitive presentation of the Buddhist path to inner freedom. The audience included established sangha, friends from our introductory meditation sessions, along with other appreciative residents of the city. We were also joined by some special guests: the Right Worshipful the Mayor of Bath (Councillor Cherry Beath) and the Mayor's Consort (Mr Richard Beath), and the local writer and broadcaster, Bel Mooney (see photo below). During the evening, Lama Jampa described why freedom does not lie outside us, but instead is found right here and now, present as the very nature of our mind. To realise this, we need to start where we are by developing renunciation through meditating on the Four Thoughts that Turn the Mind to Dharma and then through such practices as love, moral behaviour, compassion and insight, finally fulfil our buddha nature. There was also time for questions on topics as diverse at karma, materialism and the nature of the self. This public event hosted by Bath Sakya Buddhism will hopefully spark off a good deal more interest in the Buddhadharma amongst residents in and around Bath. On Saturday, 13th September, Lama Jampa Thaye visited Harrogate in Yorkshire to teach the final verses of the text ‘A Hundred Pieces of Advice to the People of Thingri’ by Dampa Sanjay and to bestow the initiation of Sanjay Menla (Medicine Buddha). In the morning session Lama Jampa highlighted Dampa Sanjay’s focus on the fundamental teachings of the dharma. Lama Jampa emphasised the importance of understanding what the Lama is, and how he or she can help us, and the necessity to grasp precious human birth in both hands, while practising in a fully adult way. Lama Jampa carefully delineated the relationships between morality, the use of antidotes from the Mahayana tradition and the ultimate teachings on the true nature of mind. In conclusion, Lama Jampa remarked that he had first received Dampa Sanjay's text from Karma Thinley Rinpoche twenty-five years ago and that it was in fact one of Rinpoche’s favourite texts. In the afternoon Lama Jampa bestowed the Medicine Buddha initiation and gave refuge to several new members of the sangha. The organisers would like to thank everyone who helped both before and during the event and look forward to Lama Jampa's next visit to Yorkshire in the Spring. Once again this year Karma Thinley Rinpoche made the long journey from his monastery in Boudhanath, Nepal to his home land in the ancient kingdom of Nangchen, in Kham, now part of Qinghai Province in China. He was accompanied by his cousin Tsodi and his assistant Kunga. Rinpoche’s advancing years means he finds the rigours of travel more difficult, but fortunately the improvements in infrastructure and travel facilities within China mean the journey is still manageable. In order to reach Nangchen we needed to take 3 separate flights and finally a car journey of several hours, crossing 3 high passes of about 4,000 meters. This year the weather was particularly extreme, with a lot more rain and snow than normal. The first pass we crossed after landing in Jyekundo was white with snow instead of its usual green and flower bedecked. In Nangchen Rinpoche based himself in his small temple called Tegchen Choskor Ling (meaning ‘Mahayana Dharma Wheel Monastery), which is located in the administrative capital of Nangchen, a small town called Shonda or also called Nangchen (called Nangqen in Google maps), located beside the River Dzachu, which is one of the main source rivers of the Mekong. Karma Thinley Rinpoche received a steady stream of visitors throughout the whole time of his stay in his temple. He is the most senior lama of the Bongsar family to which he belongs, and many of his relatives and other families connected with the Bongsar clan came to offer greetings, catch up with news and generally take the opportunity to spend some time with Rinpoche. Often visitors would come bearing offerings, which usually consisted of the things most precious to traditional nomads - fresh yoghurt, milk, butter, cheese, dry meat, and the small wild roots caller ‘troma’, which used to be the only source of sweetness before the introduction of sugar, and is still mixed with yoghurt as a special dish. One of Karma Thinley Rinpoche’s great uncles was a distinguished yogi lama called Bongsar (Biru) Kunrik. He became famous for his ability to cure sickness by his practice of long-life deity yoga, and even travelled to Sakya in central Tibet when he heard the then Sakya Trizin had fallen ill. He went into retreat near Sakya and through the power of his meditation was able to restore the health of the Sakya Trizin, Dagshul Thinley Rinchen. Bongsar Kunrik lived mostly in retreat, and built several retreat centres around Nangchen, the most prominent of which was called Sharyak Dorje Ling, quite close to the Bongsar ancestral home. When Bongsar Kunrik later passed away, Dagshul Thinley Rinchen predicted he would soon be reborn within the Bongsar family, and later when Karma Thinley Rinpoche was born, Dagshul Thinley Rinchen confirmed that he was the ‘tulku’, incarnation of Bongsar Kunrik. (In recognition of this, Rinpoche gave the name Thinley Rinchen Ling to the Sakya centre in Bristol). The retreat monastery Sharyak Dorje Ling fell into disuse after the passing of the first Bongsar Kunrik, and Karma Thinley Rinpoche has long held the wish to commemorate the site in some way. This year, at Rinpoche’s request, a group of Bongsar family members and friends worked together to erect a large prayer banner above the site of the retreat centre. A large steel central structure was made in Shonda, carried up to the beautiful remote location by truck, and finally 12 strong men manhandled it to the top of the hill above the site, and erected it using steel cables and a heavy concrete base. Rinpoche chose the colours and prayers to be printed on the banners arranged in the four directions. The same group of Bongsar volunteers also took the opportunity to make and erect a similar prayer banner assembly above the nearby site called Yeyang Sumdo, where the Bongsar palace used to stand, and where Rinpoche was born. Two years ago a large stupa was erected there, sponsored by many Bongsar people, and also a smaller commemorative stupa was erected on the place where Rinpoche’s mother was staying when he was born. Rinpoche made only one larger expedition out of Tegchen Choskor Ling this year. He wanted to visit the birthplace of the first Chokgyur Dechen Lingpa (Chokling), one of the most famous tertons, and actually one of Karma Thinley Rinpoche’s ancestors. The location is in a remote side-valley near the ancient capital of Nangchen, called Nangchen Gar. With improvements in roads and a good jeep it was possible to reach Nangchen Gar in two hours from Shonda, and the actual birthplace is another hour’s walk over a high ridge. Amongst the ruins of the old Chasu (the name of Chokling’s family) estate a small temple has been built by a monk from the Tsechu Gompa monastery at Nangchen Gar. This monastery used to belong to the Nangchen King, and Chokgyur Lingpa was a monk there in his youth. A small blue temple marks the place at Nangchen Gar where the extensive Royal Palace used to stand until the 1960s, it had more than 180 rooms. Close to the river below the Chasu estate is a large cave, where the first Chokling used to meditate. Karma Thinley Rinpoche told us that there used to be a clay statue of Guru Rinpoche in the Chasu estate temple, made by Chokgyur Linpa himself, and Chokgyur Lingpa received many termas directly from that statue. By the end of August the short Nangchen summer was already coming to a close, and snow fell on the mountains around Shonda the night before we left. After the long return journey, Karma Thinley Rinpoche is now safely back in Nepal. The final part of Sakya Pandita's brilliantly clear presentation of the Buddhist path, Elucidating the Thought of the Sage, and group practice retreat on White Mahakala (Tib: Gonkar - the wealth and protection bestowing emanation of Chenrezik) have closed a momentous summer in the 25-year history of Sakya Changlochen Ling. Whilst many participants came from England, this was an international event with around 80 people travelling from Bulgaria, France, Germany, Mexico, Portugal, Singapore and the USA as well as the UK. Since 1989, Sakya Changlochen Ling has been transformed from the rustic charm of the original buildings to an extensive gompa (temple) and retreat centre, replacing a solitary tap for washing with comfortable accommodation, catering facilities, with a beautiful shrine room as the crowning jewel. Over the past 25 years, Lama Jampa has given many important teachings and initiations there, including Lopon Sonam Tsemo's General Presentation of the Tantra Sets, Shantideva's Entering the Bodhisattva Conduct and Sakya Pandita's Discriminating the Three Vows as well as the initiations of White Tara of the Wish- Fulfilling Wheel, White and Orange Manjushri, Vajrapani Bhutadamara and many more. The latest phase in the development of Changlochen has been perfected with this year's auspicious visit of His Holiness Sakya Trizin. On a perfect summer afternoon on 26th July, His Holiness gave the initiation of Manjushri Arapatsana to a gathering of members of the Dechen Community along with honoured guests and friends from the the nearby Nyingma and Karma Kagyu centres. After the initiation, His Holiness blessed the land and then attended as guest of honour a reception hosted by Lama Jampa. He offered warm thanks for Lama Jampa's invitation, remarking that he had been kept well informed of developments over the years. Lama Jampa reassured everyone that further visits from His Holiness - and HE Ratna Vajra and HE Gyana Vajra Rinpoches - would be soon requested. Recent years have also seen a growing connection with the Kagyu and Nyingma centres in the area, particularly Dhagpo Kagyu Ling. Lama Jampa has been teaching there over the last four years and, this summer, gave teachings on the Three Vows culminating in an explanation of Sakya Pandita’s The Root Downfalls of Vajrayana. Among those attending the teaching were many lamas and drub-las from Kundreul Ling, the retreat centre originally established by Gendun Rinpoche. At the end of his teaching Lama Jampa spoke of his strong sense of the preciousness of Dhagpo and its sangha and urged them, in the light of the recent passing of Shamar Rinpoche, to do their best to safeguard this treasure of the Kagyyu tradition. As a further sign of this connection, a number of students from Dhagpo Kagyu Ling came to Changlochen at the end of the Sakya summer school to receive Karma Chakme's commentary on the Prayer to Vajradhara, a teaching which they had requested from Lama Jampa. With the summer at a close, there is now time to think about what the future 25 years could look like for Sakya Changlochen Ling, sustained by the renewed blessings of our kind lamas. Dhagpo Kagyu Ling, the seat of HH Karmapa in Europe, recently hosted three days of teaching by Lama Jampa Thaye. From August 9 to 11 Lama Jampa gave teachings on the Three Vows culminating in an explanation of Sakya Pandita's "The Root Downfalls of Vajrayana". Among those attending the teaching were many lamas and drub-las from Kundreul Ling, the retreat centre originally established by Gendun Rinpoche. This was the fourth occasion that Lama Jampa had taught in Dhagpo, which, like Sakya Changlochen Ling, is located in the beautiful Vezere valley, site of the earliest human culture in Europe. At the end of his teaching Lama Jampa spoke of his strong sense of the preciousness of Dhagpo and its sangha and urged them, in the light of the recent passing of Shamar Rinpoche, to do their best to safeguard this tre asure of the Kagyyu tradition. On a perfect summer afternoon on the 26th July, His Holiness visited Sakya Changlochen Ling on the occasion of its 25th anniversary. At the request of Lama Jampa Thaye, His Holiness gave the initiation of Manjushri Arapatsana to a gathering of members of the Dechen Community who had all travelled from the UK for the occasion, as well as dignitaries and members of the nearby Nyingma and Karma Kagyu centres. After the initiation, His Holiness blessed the land and was then guest of honour at a reception hosted by Lama Jampa. His Holiness cut the celebratory cake at the garden party which had been organised for this auspicious occasion. He thanked Lama Jampa for inviting Him, recalling that He had been kept informed of the development of the centre over the years. Lama Jampa expressed his wish that His Holiness and the Dungsay Rinpoches would now be frequent visitors to the centre in the future. Founded in 1989, Sakya Changlochen Ling is the Dechen Community’s retreat centre in south-west France. Over the years the buildings have been developed so that now they incorporate a beautiful gompa, extensive accommodation for visiting Lamas and retreat facilities. The centre is located in several acres of beautiful countryside. A summer course is held every year at which Lama Jampa gives teachings and initiations. Group and individual retreats are now also part of the activities at the centre. With the completion of the development of Changlochen, Sakya takes its place alongside the great Kagyu and Nyingma traditions already present in the beautiful Dordogne region of France. On 5 to 6 July, at the second session of this year’s Mikyo Dorje Shedra, Lama Jampa taught the third part of Karma Thinley Rinpoche’s commentary, The Lamp that Dispels Darkness, on the Third Karmapa’s text Discriminating between Consciousness and Primordial Wisdom (Tib: Namshe Yeshe) to a large gathering of students from the UK and other countries. Further to the teaching in February of this year, Lama Jampa concluded the section on the all-base consciousness (Skt: alaya; Tib: kunji) and began to teach the sections of the text relating to primordial wisdom, beginning with Karma Thinley Rinpoche's essay in defence of the Shentong view. On the Sunday, Lama Jampa bestowed the bodhisattva vow from the lineage of Manjushri, giving a detailed overview of the different extent lineages of the bodhisattva vow. During the teachings Lama Jampa reemphasised the importance of striving to unite our minds with Shamar Rinpoche's during this time. On the Saturday evening, the Amitabha tsok puja was again held at Kagyu Ling. Lama Jampa will be travelling shortly to Sakya Changlochen Ling in France to prepare for the visit of His Holiness Sakya Trizin and Lama Jampa's summer teaching programme in Sakya Changlochen Ling. Hear a historic teaching on Mind Training by Shamar Rinpoche given in Manchester, UK. On 26 June Lama Jampa gave a public talk in Stuttgart, Germany on the "Three Yanas in Buddhism". The public talk was hosted at the Linden-Museum and was followed by questions and answers. Lama Jampa emphasised during the talk that the basis for the practice of Vajrayana is the other two vehicles and their associated vows. On Saturday, 28 June Lama Jampa taught the seventh and final part of "The Telescope of Wisdom", Karma Thinley Rinpoche's commentary on Nagarjuna's "Letter to a Friend". On Sunday, 29 June Lama Jampa bestowed the initiation of "Parnashabari". The next visit of Lama Jampa to Stuttgart will be during the last weekend of September 2014, when he will teach the "Heart Sutra" and bestow the initiation of "Green Tara".